`Aisha, (complaining of headache) said, “Oh, my head”! Allah’s Messenger (?) said, “I wish that had happened while I was still living, for then I would ask Allah’s Forgiveness for you and invoke Allah for you.” Aisha said, “Wa thuklayah! By Allah, I think you want me to die; and If this should happen, you would spend the last part of the day sleeping with one of your wives!”…. 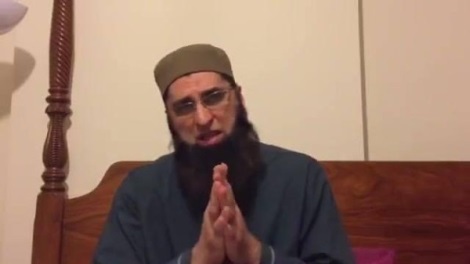 I am a critic of Junaid’s views about woman (he shared some about woman driving earlier as well) in general, and I would like that views degrading a section of people (e.g. women, minorities etc.) should not be allowed to be broadcasted, but I don’t see anything Blasphemous in that. The hadith about “Rib” is general about woman and does not make any specific exclusions. I have heard most of Molvis holding similar views about woman in general. I think the real reason behind “extreme reactions” is that people in general do not read Quran, Ahadith or life of Sahaba RA. When one does not understand things, he makes simplified assumptions about them. There had been differences between Sahaba RA and they have used sometimes very harsh language with each other and the issue of Blasphemy never popped up. People have simplified assumptions about correctness of every “hadith” and super-human assumptions about “personalities”. Once one reads ahadith he comes to know that the world was a natural world where people used to differ – often seriously differ – and openly expressed their views even to Prophet SA. That openness was strength of that society and nurtured trust. Musa AS was so angry about committed “Shirk” in his absence that he “threw down tablets” and seized his brother by head. If it had been Pakistan, “Shirk” would have no problem but “throwing down tablets given by Allah” would have been termed a Blasphemy. I see people comfortable with watching half naked woman on TV all the time but would flare up as soon as word Blasphemy is used even without proper proof of what was said. The irony of situation is that people like Dr Amir Liaqat openly used vulgar language about Junaid’s mother. What nonsense in the world is that. What is fault of his mother. Amir Liaqat is the same person who was using abusive language right between recording of Qaseeda Burda Shareef in a leaked video, and who also was saying “Uthatay naheen kion nabi ka janaza.. Kahan reh gaya baitian denay walay” (Referring to Hazrat Abu Bakr RA and Umar RA) in a charged crowd in another leaked video. More hypocritic is the fact that original Hanafi opinion even about a person who commits Blasphemy against Prophet SA is very balanced. It is that he would be spared if he repents. And there is no punishment for woman and non-muslims unless they are known to commit Blasphemy habitually. Abu Yusuf (Abu Hanifa’s disciple) writes in Kitab al-Kharaj: If a Muslim abuses the Prophet (sws), calls him a liar or ascribes blemishes to him he becomes kafir of the Almighty Allah. His wife is permanently separated from him. If he repents [he will be spared]. Otherwise he will be executed. The same is the ruling regarding such a woman. However, Abu Hanifa [differs on this issue and] says that woman will not be killed. Rather she will be forced to reenter Islam. Imam Ibn Abidin is one of the most important authorities in Hanafi Madhab after the first generation of scholars. His book radd-ul-mukhtar is seen as an authority in issuing fatwas and investigating the popular opinions in hanafi fiqh over various issues. He has discussed the matter of sabb-e-rasool in great detail in this book as well as in Rasael-Ibn-Abidin. Imam Ibn Abidin explains that the first Hanafi Scholar who claimed that the repentance of one who commits sabb-e-rasool will not be accepted was Bazazi in the 15th century AD. There is not a single Hanafi Scholar before him that has said something along the same line. Imam Ibn Abidin further explains that even Bazazi seems to have mis-interpreted the legal opinions of other scholars. And one of issues with Jews and Christians was that they gave the right of deciding things as Halal and Haram solely to their Scholars. This was termed as making the Scholars partners with Allah (See tafseer of 9:31). So I think its our duty to spread the word and change the Blasphemy law to original Hanafi position so that no more lives are taken in the name of Islam and it becomes easier to preach Islam. And he mentioned that more than once I think. Thus the hasty apology. are not necessarily liked by feminists but true infact! those who have considered JJ an innocent can make talk with Muzaffar shah about this matter, who have already challenge his words otherwise please stop this topic discussion in social media. we don`t have enough deen knowledge to claim the Ulama words.